The Yasawas comprise 20 ruggedly beautiful islands sprawled along north-western Fiji, encompassing 6 main islands and numerous smaller islets, in a total area of 135 square kilometres. These Fijian gems are less tailored towards tourists and more sparsely populated than the Mananucas found to the south, making them an ideal destination for nomadic backpackers or those looking to escape from the hustle of civilisation. Rather than roads, cars and shops, there are idyllic and remote villages taking their stead, with locals surviving on agriculture and the relatively limited supply of tourism. Because of this, the choice of accommodation varies greatly, with everything from a humble hut to an upmarket villa with an outdoor shower to pick from, depending on your budget. Just like the dramatic mountain ranges - four of the largest islands’ peaks reach 600 metres in height - the turquoise waters await a lengthy exploration. Snorkelling and SCUBA diving are readily available in most areas of the archipelago, and the underwater landscape doesn’t fail to deliver; it boasts vividly coloured coral reef, an abundance of tropical fish and teems of migrating manta rays between May and October. 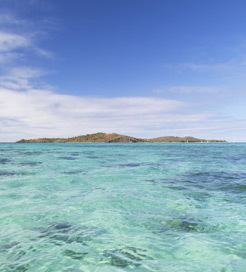 The long, slender Yasawa Islands also offer excellent sailing opportunities, with a seemingly endless number of tranquil coves and beautiful islets to navigate between. The Sawailau Caves towards the north are a must see. This secret haven is characterised by limestone rock formations and a network of deep pools ideal for swimming. They are also believed to be the resting place of the ancient Fijian ten-headed snake god, Ulitini, adding a splash of mystery to the remarkable scenery. If pure relaxation is what you’re after, the Yasawas own some of Fiji’s finest beaches, offering supreme stretches of immaculate sand allowing you to unwind on a hammock, enjoy cocktails or savour freshly caught seafood from a beachside restaurant. The Yasawa Islands are within easy reach from Denarau on the Fijian mainland, with daily crossings provided to most of the islands. The routes are operated by Awesome Adventures, a company using high-speed vessels, enabling you to dock in the Yasawas within 2-5 hours, depending on your destination.